I bet you know a Linda. I bet she is somewhere between the ages of 52-74. No, I’m not testing my psychic abilities, I just know that Linda was a wildly popular name for girls in the United States from 1941-1963. So I just did some math. In fact, Linda ranked in the top three for sixteen years, from 1944-1960, and was numero uno for six years running from 1947-1952. Why you ask? What’s the fascination with the name Linda? I mean, it’s a lovely name…in Spanish it means beautiful…but why number one for six years straight? Linda ranks 6th for number of years at the top, but 5th overall for those named between 1914-2013 with 1,447,270. 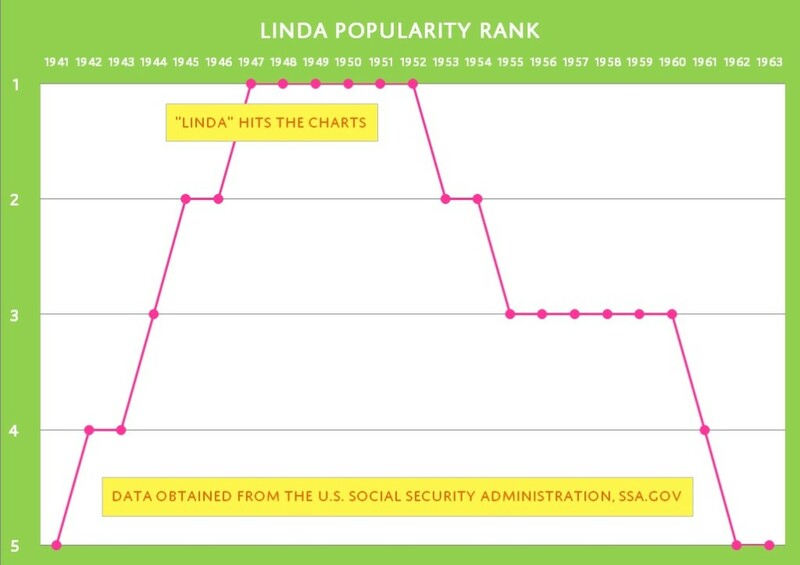 Actually, six years at the top isn’t really a big deal (see the chart), but for two things: Linda broke the Mary streak, and Linda seems to be the only popular name attributed to a cultural craze. 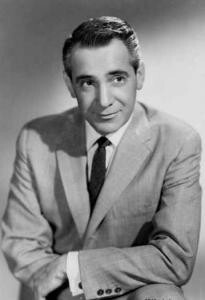 You may know the song “Linda,” it was a huge hit for Buddy Clark back in February 1947. Yes, 1947, the same year that the name Linda hit number one with American parents for the first time! This story has an interesting twist: the song was written in 1942 for one-year-old Linda Eastman. The same Linda Eastman that would grow up to marry a guy named Paul McCartney – you may have heard of him? The lyrics aren’t aimed at the toddler set—at all—so how did this come about? 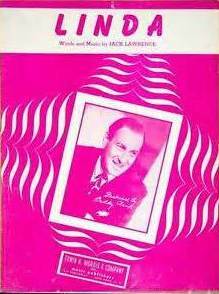 Songwriter Jack Lawrence was close friends with his attorney, Lee Eastman. Eastman asked Lawrence to write a song inspired by his new daughter’s name. 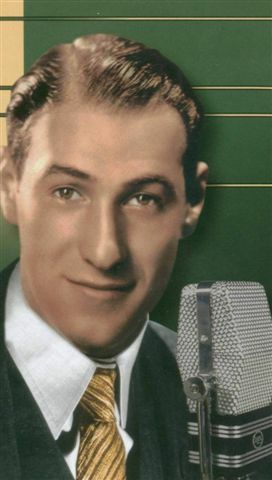 Would you believe that nothing happened with my “Linda” song until…1946? My attorney friend called to tell me that one of his clients, Charlie Barnett was starting a company and in return for publishing rights, agreed to record “Linda.” Okay, I said. And then a weird thing happened. Somehow, Ray Noble got an advance copy of the song, fell in love with it… and recorded it with Buddy Clark singing the vocal. 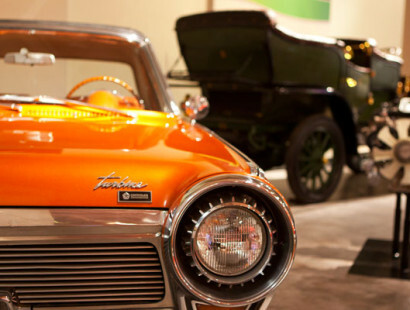 After all those years of going nowhere, “Linda“ was an overnight sensation. …And so the Linda Generation was born! WHY AM I WRITING ABOUT LINDA? Hello Creeper! And that tie??? I’d be running from the tie alone. WHY DO NAMES BECOME POPULAR? Studies show it is “herd mentality”—people go with what others do—and change is simply random. When you look at the top five names over time, you see a name move up the list, like Linda from 1942-1946, and when it reaches Number One people are hooked and it stays there for years. The final analysis on Linda?…compared to Mary, Jennifer, and Emily, the fad burned hot and fast. A flirty song arrived at just the right moment to give Linda the boost to unseat pious Mary (temporarily), making it a rather unique trend! Are you a Linda? 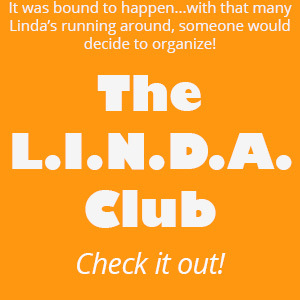 Might you join the LINDA Club? And how about the song, what do you think? Let me know in the comments! Come on over to Facebook and see what’s new there too! 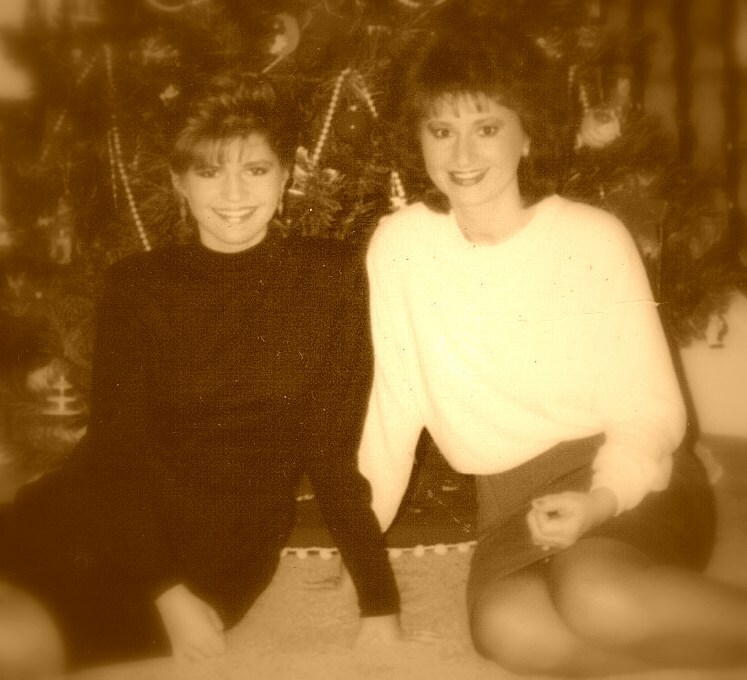 Me and my Linda…back in the day! United States Social Security Administration, Official Site, http://www.ssa.gov/OACT/babynames/top5names.html, accessed January 21, 2015. United States Social Security Administration, Official Site, http://www.ssa.gov/OACT/babynames/decades/century.html, accessed January 21, 2015. 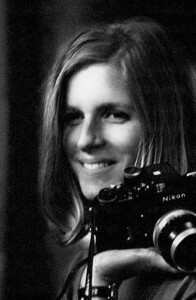 Wikipedia, Linda McCartney, https://en.wikipedia.org/wiki/Linda_McCartney, accessed January 21, 2015. Sounes, Howard. Fab: An Intimate Life of Paul McCartney,Cambridge, MA, De Capo Press, p. 173. I love the things I learn from your blog each week, thanks for the education. I actually enjoyed the song and thought it was romantic, not creepy. Would love to hear how their first date went! 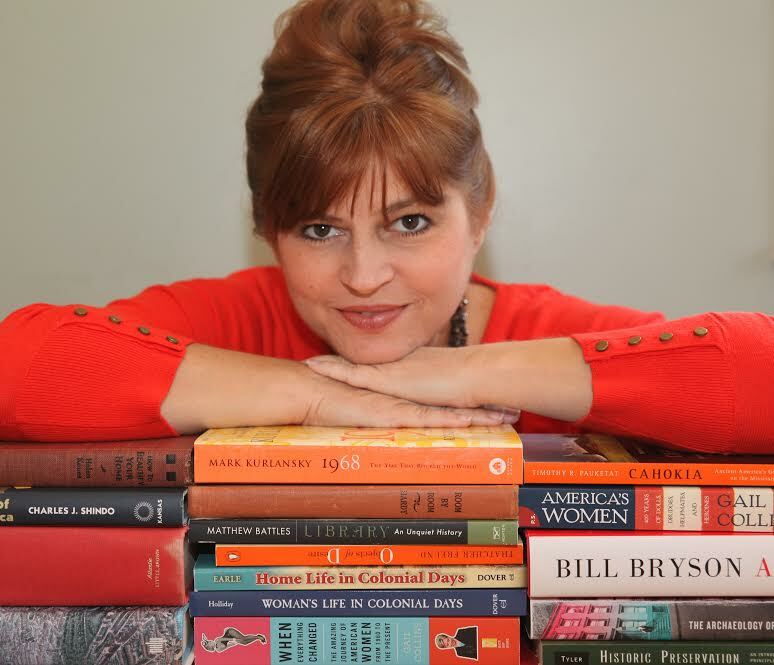 Glenda I’m glad you like the blog–and the song! It’s actually one of my favorites. For me, the idea of someone waiting for me to walk by every day would freak me out a little, that’s all! 🙂 I think it’s funny how Linda’s playing hard-to-get is just an act–she was pretty easily swayed in the end! 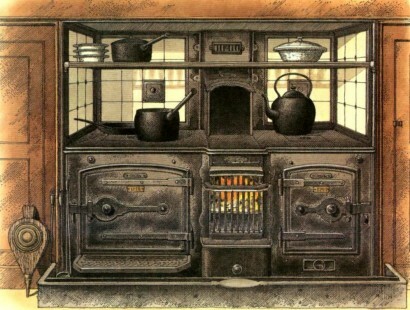 I love the oldies, they don’t make ’em like that anymore! The song . . . ahhh, a little cheesy, and yes Linda was easily swayed wasn’t she! 😉 It was a popular name back then, but in recent years you rarely hear of someone naming their daughters Linda. I was actually surprised that while you were coaching pom that there was a Linda on one of your squads, among all the Heathers! This is so interesting to me!! “Linda”. I was born in 1951 and named for that song. Many special memories of our Dad singing it to me! My Dad has been gone many years now but I wonder if he made that verse up himself ir if it was part of yhe original song. What a sweet memory! That is the first line of the song (after the talking intro). 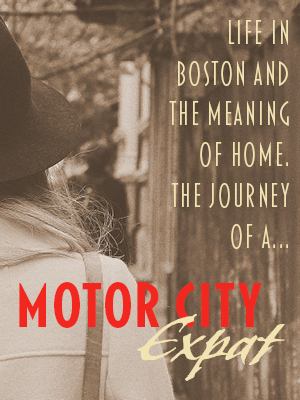 The video in this post is a shortened version of the song–missing a whole minute! 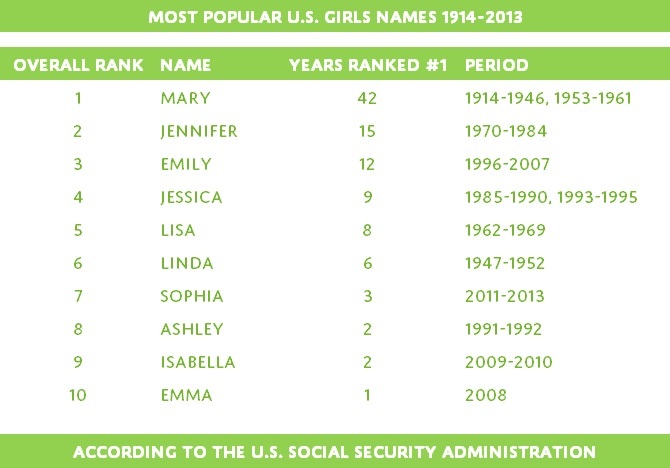 Great post – I had just discovered the bump in Linda’s popularity while browsing through the SSA baby names database (don’t ask). I figured it had to be a famous Linda that was causing it, but I couldn’t think of any film or pop stars from the 40’s named Linda. Your post answered the “why” for the peak popularity bump (I didn’t know about the song). I knew of later bumps, like the Jennifer bump in the 1970’s after the movie “Love Story, but I had no idea about the Linda phenomenon, especially that the song was written for Linda Eastman. The popularity of names ebbs and flows, often sparked by some popular culture reference. 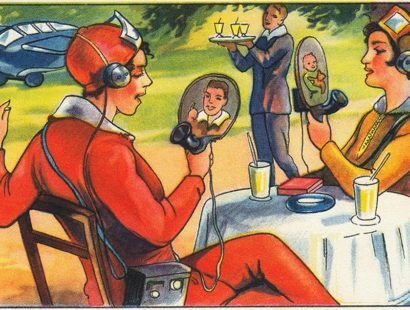 Maybe the rise of Linda in the 1930’s doesn’t have any particular spark, but I wouldn’t be surprised if it did. If you have any clues about this, I’d love to hear them. Well John, you piqued my curiosity! It turns out there were two movies released that coincide with the spike. The first in 1935 called Accent on Youth, starred Sylvia Sidney as Linda Brown. The second in 1936, Wife vs. Secretary, starring big guns Clark Gable, Myrna Loy and Jean Harlow. Loy’s character was Linda! I would bet money this caused the sharp rise in “Lindas” over 1935-36, priming the masses (that “herd mentality”) to really fall in love with “Linda” when the song came out ten years later. Thanks so much for your comment and the link, and Happy New Year! My mom used to sing that song to me when I was little, but a different verse about counting sheep. I was born in a generation which doesn’t have many Lindas. I am forever hearing, “Oh, my mom/aunt/grandmother is named Linda.” I think I would have made a better Lindsay. My mother named me “Linda Susan”. because Shirley Temple named her daughter Linda Susan.. My mother was a big fan of Shirley Temple back then.